Welcome, this is my third blog hop today. 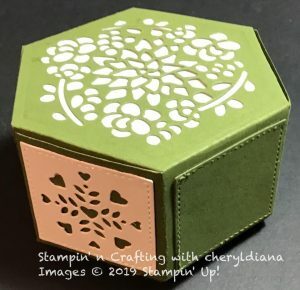 This lunchtime I am Blog Hopping with Stampin Friends 2019. 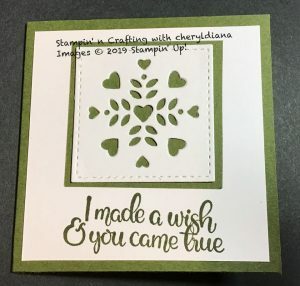 This aim of this Blog Hop is to make a card and another project using Stampin’ Up! products. This month’s theme is LOVE. For this month’s theme I decided to make a small box and card for my wonderful hubby. When we got married 3 years ago our wedding colours were, Whisteria Wonder, Pink Pirouette and Mossy Meadow. Unfortunately the first two colours are now retired but the wonderful news is that Stampin’ Up! brought back Mossy Meadow. So of course for my LOVE card and project I had to use Mossy Meadow. The box is die cut using the Window Box Thinlits. I used one of the squares from the Stitched Shape Framelits as this fits the box perfectly. 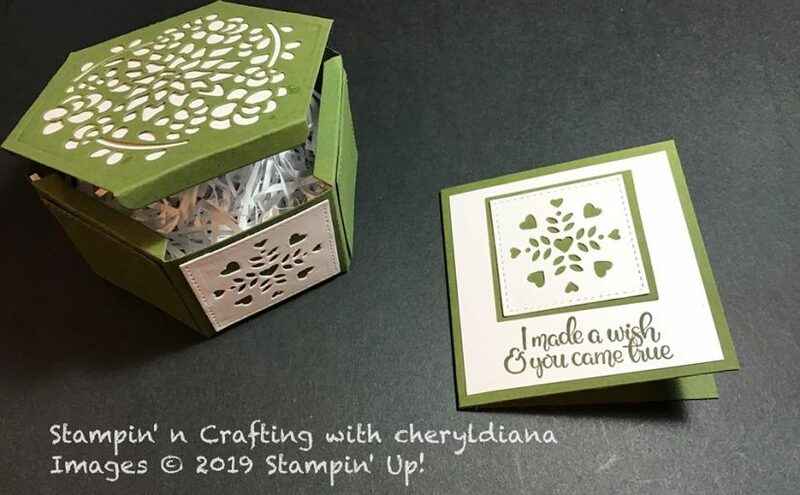 I used the heart die from the Window Box Thinlits to die cut Whisper White card stock and fixed to the box. I wanted 3 sides white and 3 sides Mossy Meadow. I then finished off the box with white shedding so that it is ready for my gift. 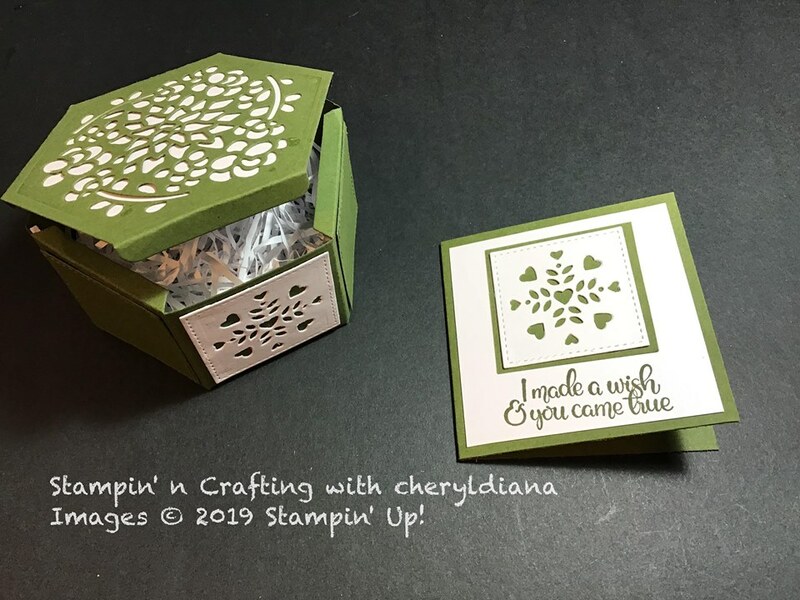 The card is a simple 3×3″ card base, a Whisper White matt layer onto which a sentiment from Dandelion Wisher stamp set has been stamped on using Mossy Meadow ink. I used the same heart die and Mossy Meadow square as above to decorate my card. I hope you have loved my projects today. Please do leave comments as you hop around and see what cards and projects the others have done. What a pretty box top. Thanks for sharing. I love the colors you have chosen and the projects are really beautiful. Great job! 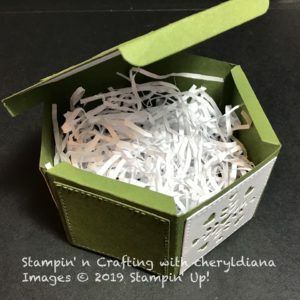 Fun project – that box is so cute – and nice to see other colors but red lol! Super cute! I’d forgotten all about the hexagon box, going to dig those framelits out again I think! I forgot about this beautiful set! Nice job! I love using the window box thinlits and great colors! !